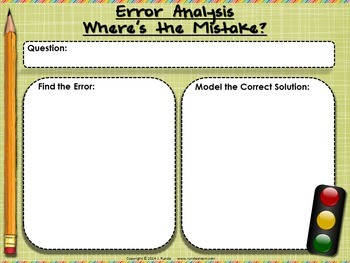 This is a blank template I use often in my classroom during math activities, or as a kind of group exit slip or diagnostic to see if students can spot the error. This resource includes both the powerpoint version (so you can add textboxes over top of where you wish to add your information), or the PDF – which is what I use. I simply project the PDF onto the whiteboard and we use our whiteboard markers to write in the boxes. You can also print and use the blank PDF and use a center or a guided math activity. I use this activity as reinforcement/review when I see an error commonly happening in the classroom. I can quickly pull up the template (which I have as a shortcut on my computer desktop) and write in the question and incorrect solution. I ask students to look at the incorrect solution, find and circle the error on the board, and then model the correct solution on the right hand side.